Indians, explorers, squatters, and bandits are all part of Calabasas history. The Chumash Indians led a peaceful life amidst the rolling hills, making their homes in canyons where streams and springs ensured a plentiful supply of wildlife. Acorns from the massive old oak trees that thrive in the area formed an important part of their diet. Some of the oaks in Calabasas may be 500-700 years-old today. Settlements of Chumash Indians named the area Calabasas, a word perhaps descended from the Indian word for “where the wild geese fly.” Others think Calabasas comes from the Spanish word for pumpkin or wild gourd. After the turn of the century, several select spots in the Calabasas area developed into weekend respites from the city. Crater Camp in Monte Nido was opened in 1914 as a year-round picnic ground. The Stunt family developed a homestead on the north slope of Saddle Peak, also in the Monte Nido area. A favorite spot for filming motion pictures, the scenery was ideal for Hollywood. Today, it is a superb monument to a bygone era, with meticulously maintained furnishings and grounds, and serves as an anchor for Old Town Calabasas. 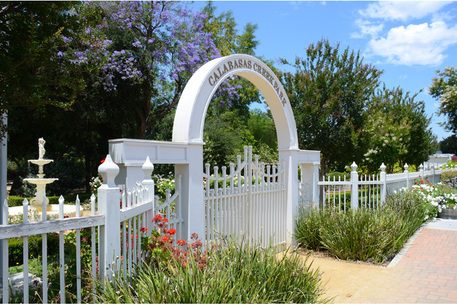 The first subdivision in Calabasas, called Park Moderne (in Mulwood near Calabasas High School), was a retreat for artists, craftsmen, and writers. A walk on Calabasas Road in the historic Old Town, takes one past several old buildings.